Google just announced a very cool mobile feature that would rival anything you might find on the latest Warrior Forum offers. Seriously, if a popular marketer had released a plugin like this, we’d be lining up on the sales page to get our hands on it. No worries though, Google is the developer and there’s no cost involved – other than the technical knowhow. Google Plus Content Recommendations for mobile is another HUGE reason to get very serious about both mobile and G+. Just like we see in Google’s personalized search, a little avatar of someone we know recommending content is a no-brainer. For example: Forbes visitors can now more easily discover other Forbes articles based on Search Authorship signals and other articles with lots of Google+ activity (including +1’s and shares). Wow, “articles with lots of Google+ activity (including +1’s and shares)”? Can you think of a better reason to get very active on Google Plus? 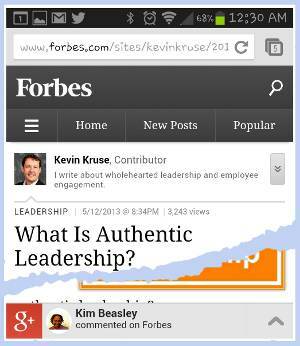 Naturally, I had to run over to Forbes.com with my Android and try this tool myself. At first, I wasn’t able to get the recommendation feature to show itself. All I was seeing was a little ad running in the footer. It turns out the Google recommendation section doesn’t display (On Forbes) until you scroll back up; at least that’s how it worked for me. So you scroll down the page a little and as soon as you scroll back up, you get the little G+ Logo in the footer (replacing the ad in this case) along with interactions from people in your circles. I haven’t tried it while logged out of Google but you are still supposed to see the recommendation when logged out. When I clicked on the G+ logo, I was sent to a customized Google Plus feed that shows all of the Forbes.com articles posted by people I have circled. This is pretty powerful, in my opinion. Want to try it on your blog? You have to have authorship and a Google Plus Page. You’ll also want to be active in Google Plus so if you’re still playing full time on Facebook you might want to reevaluate your strategy. Can you see the potential of this powerful recommendation feature? Is this something you’ll try on your blog? Wouldn’t it be cool to have it on all versions of our blog? Does this amplify the importance of Google Plus? Are you concerned about mobile traffic? I’d love to see your comments below.